Ukraine's President Petro Poroshenko (L) and parliament speaker Volodymyr Groisman lay flowers by the photo of a police officer who was killed in violent clashes Monday, in front of Parliament in Kyiv, Ukraine, Sept. 1, 2015. Two more Ukrainian National Guard officers have died from wounds caused by a grenade blast during Monday's violent demonstrations in the capital Kyiv, bringing the death toll to three. Officials announced the deaths of the two servicemen Tuesday, a day after nationalists clashed with security forces outside the country's parliament building. The nationalists were protesting constitutional amendments proposed by the government that would give greater autonomy to parts of eastern Ukraine controlled by Russia-backed separatists. The legislation won preliminary parliamentary approval Tuesday. One of the protesters allegedly tossed a grenade, wounding dozens of law-enforcement personnel, including a National Guard officer who died in the hospital Monday. The injuries sustained by security forces also indicate "the use of a large number of heavy and sharp objects" by protesters, President Petro Poroshenko's website said Tuesday. About 140 people were hospitalized as a result of Monday's violence, most of them law-enforcement officers. Ukrainian protesters clash with police after a vote to give greater powers to the east, outside the Parliament, Kyiv, Ukraine, Aug. 31, 2015. Ukraine's Interior Ministry announced Tuesday that it has called more than 30 people in for questioning in connection with the violence, including the leader of the nationalist Svoboda party, Oleh Tyahnybok, and several other party members. 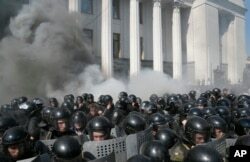 The authorities say a Svoboda member is in custody for throwing the grenade. The party has denied responsibility for the violence and accused the authorities of being the first to use force during the demonstration. The presidential website said Tuesday that "the rally which led to the tragedy" was organized by several political parties and organizations, including Svoboda and the Radical Party of Ukraine, which announced Tuesday that it is withdrawing from the five-party parliamentary coalition whose largest member is the Petro Poroshenko Bloc. Smoke rises outside Ukraine's parliament building as riot police clash with nationalist protesters, in Kyiv, Aug. 31, 2015. 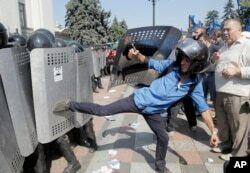 On Monday, Poroshenko called the violence outside the parliament a "stab in the back" and "an anti-Ukrainian action." A Western-backed peace plan agreed to earlier this year calls for Kyiv to adopt "decentralization" by the end of the year. A total of 265 lawmakers in the 450-seat parliament gave preliminary approval to the changes called for by President Poroshenko. A final vote is expected later this year. The protesters denounced the reforms "un-Ukrainian," and said the constitutional changes would effectively legalize the rebels' control of eastern Ukraine, even as the insurgents say the changes do not give them the semi-autonomous status they are seeking. The Obama administration on Tuesday welcomed the Ukrainian parliament's preliminary approval of the constitutional amendments. U.S. National Security Council Spokesperson Ned Price called the move "an important step toward comprehensive reform of Ukraine’s governance and the empowerment of regional and local authorities." The United States condemns Monday's violence and "urges all Ukrainians to refrain from violence as a means to achieve political objectives," Price said.